The easiest way I've been taught to check your maturity is with a metaphor. Are you a child, an adolescent, or an adult. Children don't know right from wrong. They can't take care of themselves or feed themselves. They are reliant on others to guide them into a self-sustaining life. They don't know how to study the Bible for themselves or apply it to their life. Another characteristic is childish behavior, doing things that gratify you now, but in light of an eternal perspective are incredibly foolish. The key word for children: Dependent. Adolescents know right from wrong. They put childish behavior away from them. They have learned how to feed and care for themselves. They are still basically self-focused when it comes to learning, care, and growth. It is a transitional stage, but as we all know from experience many people get stuck here and never move on. The key word for adolescents: Independent. Most people make this mistake, they think: I am no longer doing childish things. I know a ton. I can care for myself. Therefore I am mature. In reality you are not mature, you are an adolescent. So what separates adolescents from adults (in our metaphor)? Simple. Mature people are parents. They care for someone else. They bring a child along. That is the real mark of maturity. They are no longer focused on self. They will be growing, but primarily by helping others. The key word for adults: Interdependent. 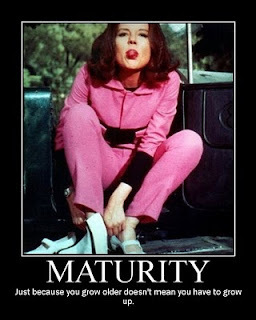 So time for a gut check... What is your maturity level?